Mingjie Liu, a graduate student in Yakobson’s Group, has been named as a “Best Poster” nominee at the 2014 MRS Fall Meeting. 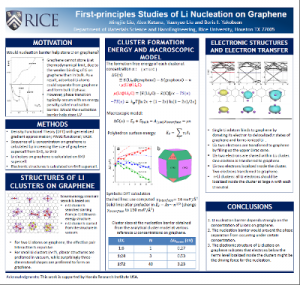 The poster presents a recent work on the Li clustering process on graphene, reporting the geometries, nucleation barriers and electronic structure of the clusters using first principles calculations. The concentration-dependent nucleation barrier for Li on graphene was estimated as well. While the nucleation occurs more readily with increasing Li concentration, potentially leading to the dendrite formation and failure of the Li-ion battery, the existence of the barrier delays nucleation and may allow Li storage on graphene. The electronic structure and charge transfer analyses reveal how the fully-ionized Li adatoms transform to metallic Li during the cluster growth on graphene. As a reward, nominees are offered the opportunity to record a short talk about their posters which will then be posted to MRS OnDemand®. This entry was posted in Group-related news by e.penev. Bookmark the permalink.